Your Samsung Galaxy Note 2 offers you many options about using the S Pen. You can simply open the menu or go back with simple gestures. Follow the information below to improve your experience using Samsung Galaxy Note 2. If you want to go back, you will simply need to draw a less than arrow (<) with your S Pen. To open the menu, you will have to draw a carat (^) with the S Pen. If you want to open a Popup Note, you will double tap the screen while you are holding down the S Pen. To launch Open quick command, you will have to drag the pen from the bottom to the top of the screen while holding down the S Pen button. 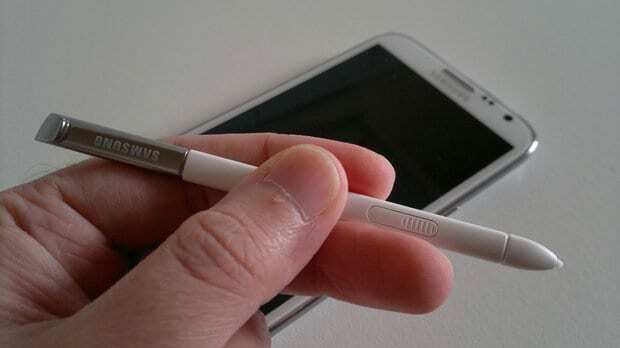 If you want to Capture screen, you will tap and hold the screen while you are holding down the S Pen button. If you want to Cut out an image, you will have to hold down the S Pen and draw a closed shape around the area you want to cut. To select a text, you will have to underline the text while you are holding down the S Pen. Using Quick commands, you can use faster your Samsung Galaxy Note 2. You can open applications, search for key words or perform predefined tasks. All you need to do is to drag the S Pen from the bottom to the top of your screen. To work faster, you can simply write the command and your Galaxy Note 2 will help you to perform it. Also, you can create a personal command in addition to the predefined commands on your Samsung Galaxy Note 2. First, you will need to go to Menu from the Home screen. Then, you will tap Settings, S Pen, Quick command settings. Tap plus button to add a new command. Now, you will have to select the command for an application or a function. Tap the application in the list. Tap Command only to begin. Tap a command for Camera and tap Sym to view a list of symbols you can use. Tap Done to finish the job.